Death by car is random and sudden—which, unfortunately, means it tends to fall into the category of "accidental," and hence, unpreventable. But with traffic deaths set to outpace AIDS/HIV and malaria in the developing world, the UN is trying to change that perception—and this shocking interactive map ought to help. Right now, 1.2 million people die on the road every year. But according to the UN, that number is set to triple over the next two decades. We're in the midst of a crisis very few people are paying attention to—in part, because wealthy donors are more attracted to health crises like HIV and malaria than road safety. 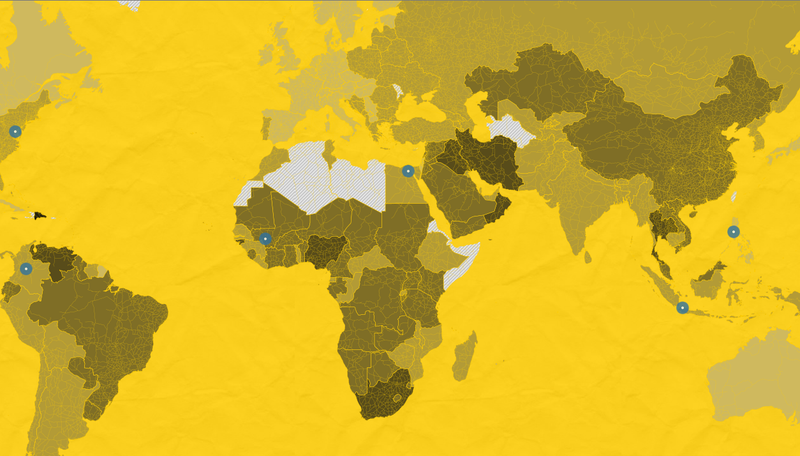 This week, a crack team of Pulitzer Center journalists published an interactive map showing just how prevalent these "accidents" are. It also includes a little tour of the best and worst nations (click "fullscreen" below to see it), bringing a few interesting facts to light. For example, Nigeria only recently made it mandatory to pass a driving test—before, you could just buy a license. Sweden is doing the best at ending traffic fatalities, with less than 300 people killed each year. Australia—once a country of insane, lawless drivers—has seen an 80 percent decline in road deaths over the past four decades.